This month's web challenge is going to be a little different than most other months. This time around, I would like you to pick two of the four photos shown and use both of them as inspiration on your page. For example, you might like the texture of the brick wall, but want to balance it out with the delicate colors and forms of the butterfly. Or maybe you have a great photo of flowers against a cracked bit of sidewalk. It can be based on colors, textures, shapes, subject matter and so forth, but instead of just using one photo, you will need to choose the inspiration from two of them. When you scrap your LO, please tell us which photos you used and how they inspired you, as well as how they are reflected in your page. 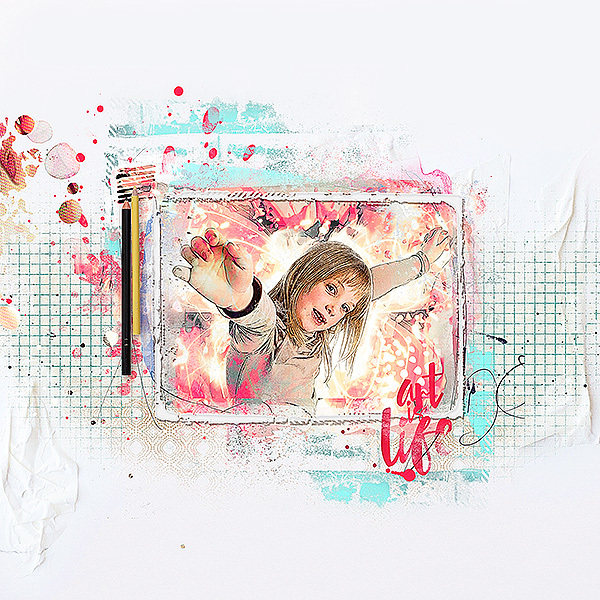 Scrap a page inspired by two of these photos and tell us how that reflects in your LO. Your page must be posted in the Challenge 3 Gallery by the end of the month and linked back to this thread. Great challenge. Motivated by butterfly and circle shape of the wheels - my photo and many of the flowers. Last edited by pennysan; 11-01-2015 at 12:23 PM. Thanks for the inspiration! I knew right away which photo I was going to use! The grunge of the barn paired with the softness of young "love". I combined a Photo of Madeleine - resting on a doorstep - and a Photo of an old Tower in the Zoo. I love how you combined these photos to make your pages stunning!